Harvard Square Editions, 9781941861288, 212pp. Winner of the 2017 Gold IPPY Award for Best Fiction of the Mountain West. Set in the tinder-dry Southwest--and based in part on real events in the early nineties and mid-aughts--Hot Season explores what Oregon Book Award Winner Cari Luna called "the charged terrain where the youthful search for identity meets the romantic, illicit lure of direct action." Born and raised in rural west Michigan, Susan DeFreitas spent fourteen years in the high country of Arizona before moving to Portland, Oregon, where she has lived since 2009. An author, editor, and educator, her work has been featured in over 30 magazines, journals, and anthologies. A beautiful book that asks the crucial question, is it worse to destroy a dam or to destroy a river? Which is to say, how do we live our conscience on a crowded, corrupted planet? 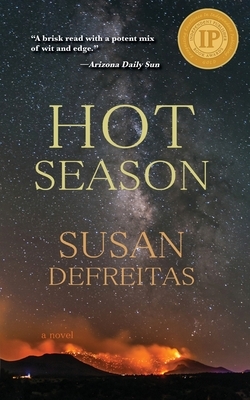 Hot Season, Susan DeFreitas’s finely wrought debut novel, explores the charged terrain where the youthful search for identity meets environmental activism and the romantic, illicit lure of direct action. A compelling book. Susan DeFreitas’s provocative novel asks big questions—not only about water rights and the importance of riparian corridors in the West, but about what it means to fight for the natural world. Young and idealistic, her characters are vulnerable, intricately rendered, and utterly engaging. Hot Season is a knockout. In Susan DeFreitas’s riveting debut, the desert landscape looms large over the dreams and desires of three friends contending with big questions—such as who to love, who to trust, and what to sacrifice for the greater good. A tale of youth, lust, and activism, Hot Season is a beguiling college novel in the tradition of The Secret History. The characters of Susan DeFreitas’s exuberant new novel populate the American Southwest with wit and pathos. Half collegiate romp and half impassioned plea, Hot Season is a heartfelt debut that will grip readers with the fervor of first love. In Hot Season, Susan DeFreitas debuts a striking novel that reaches beyond its Southwestern landscape and touches on the universal. Her activist characters are driven equally—and compellingly—by their passions and their flaws, and the resulting narrative is one that’s lustful, political, tremendous fun, and unafraid of tackling difficult questions.